Fort Scott was one of many forts built specifically for the purpose of the defense of Washington D.C. during the Civil War. Because Washington was so close to Virginia, a Confederate state, and the slave owning state Maryland was to the north, it was necessary to protect it in any way possible. Hence the Union Army built an elaborate system of forts that would become Washington’s most important line of defense. 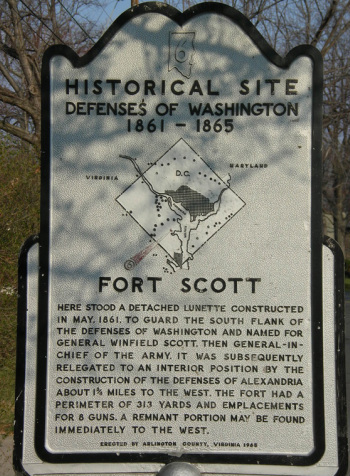 Fort Scott was located in Arlington, Virginia and named after General Winfield Scott. It was constructed in 1861, shortly after the beginning of the war. This fort was where Charley was garrisoned for much of his time in the First Connecticut Heavy Artillery, and the location from which all of his surviving letters came. The fort itself had a perimeter of 313 yards and could hold 8 cannons. It was meant to protect the Southern flank of Washington. From his letters, I believe it’s plausible to say that Charles did not enjoy the tedium of being garrisoned at the fort. He, on multiple occasions, indicates his boredom. Sometimes he fights it by studying, while other times he just seems tired by inaction. This may have been yet another reason why he wished to leave his regiment for the Colored Troops; to get some action, instead of just waiting for nothing to happen except the tedium of drills and duties [see Inactivity].